Lima Senior High’s 1960 football backfield included four Division I scholarship players: QB Vance Shuman (Purdue), fullback Eddie Kimbrough (Iowa State), tailback Tom Barrington (Ohio State) and wingback Otis Williams (Iowa State). 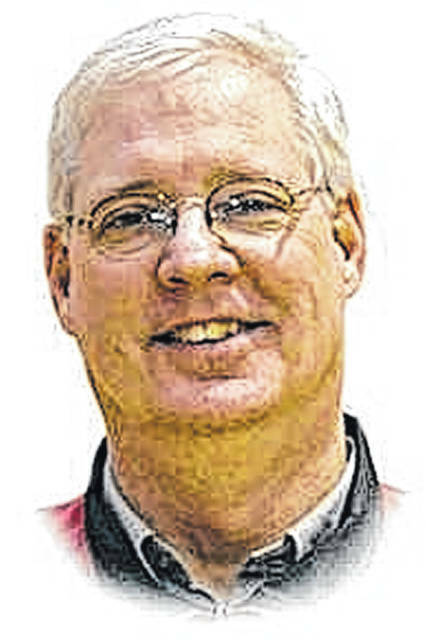 Longtime local rival basketball coaches Jeff Heistan (Shawnee), Paul Whitney (Lima Senior High) and Bob Seggerson (Lima Central Catholic) all have the same birthday: April 1. Heistan’s wife’s (Sonja) birthday is Feb. 6. Seggerson’s wife’s (Janie) birthday is Feb 5. Cue “Twilight Zone” music. In 1954, Lima Central High School graduate Cleo Vaughn became the first African-American basketball player to suit up, score and earn a varsity letter for Ohio State University. Ottoville and Columbus Grove played eight overtimes in a game in 1984 equaling a state record. Both were undefeated entering the game. Columbus Grove won 74-71. Ohio State’s Hall of Fame basketball coach, Fred Taylor, left an interview for the head coaching job at Lima Central High School in the early 1950s assured that the position was his. It wasn’t. Disappointed, he became a volunteer assistant at OSU, eventually rising to be one of the most successful coaches in Buckeye basketball history and leading them to their only NCAA championship in 1960. In 1944, in the midst of World War II, while the Lima St. John’s High School basketball team was preparing for its first regional tournament game ever, the starting point guard and captain, Leo Murphy, turned 18 and was drafted into the army. He left on a troop train headed for basic training the day before their big game. They won. (the game and the war). Miller City High School, originally called Palmer High School, did not have its own gym early in the last century so desks out were cleared out of a classroom, baskets were hung on the walls above the chalkboards, and a love affair with the game of basketball started. Shawnee High School’s Steve Arlin pitched Ohio State University to the 1966 college World Series championship and was named the MVP of the tournament. He was the first Buckeye baseball player to have his jersey (22) retired and was also one of the first players inducted into the college baseball hall of fame. Ada High School, coached by Charles Morehead, qualified for the very first OHSAA basketball state tournament held in 1923. Ada lost in the semifinal game, 15-13, to Lorain. The first recorded boys basketball game in hoop happy Putman county was in 1908. Ottawa lost to Defiance 27-25. In 1949, Delphos St. John’s became the first high school in Ohio basketball history to lose a postseason tournament game but still advance to win the state championship. DSJ lost to St. Rose in the Exempted Village Tournament (now sectional) final but, in that era, both teams advanced to district tournament. The Blue Jays returned the favor in the district final, beating St. Rose 44-35 on its way to its school’s first state title. Shawnee’s powerhouse 1964-65 basketball team that advanced to play at state had eight players who all received Division I athletic scholarships: Starters Jeff Miller (Ohio State University-basketball), Ron Core (Miami University-football), Rick Snider (Purdue-basketball), Adrian Zuber (BGSU-basketball), Denton Sullivan (Nebraska-basketball) and their first three off the bench, Bruce Burden (Kent State-basketball), Greg Monroe (University of Cincinnati-golf) and Pup Cleaves (Miami-football). Ron Cook, a 1954 Central High school grad, was a member of Ohio State’s Big Ten championship team that played Oregon in the Rose Bowl in 1958. Bob Hope was the master of ceremonies for the banquet honoring both teams. Hope called the Buckeye’s legendary coach, Woody Hayes, to the podium and asked him to select one of his players to receive a kiss from Jayne Mansfield, a voluptuous Hollywood movie star in that era. Hayes picked Cook, who then bolted to the stage and planted a big wet one on the shocked, blonde bombshell, to the everlasting admiration of his teammates. Ron still hasn’t wiped the grin off his face (it’s on YouTube). The highest scoring high school game ever played in this area was a 1971 game between Perry and Continental. Final score: Continental 130, Perry 90. The Bath High School women’s basketball program has the most wins in the history of women’s basketball in the state of Ohio – 842 and counting. The Simpson family has three generations of players who helped lead their teams to state. Phil, for Lima Senior in 1968. His son Greg, for the Spartans in 1993 and Greg’s son, Jamir Simpson, who played for Pickerington Central last season. It’s in the genes. (note: Jamir plays for LSH this season). Tom Heckman (Ottawa-Glandorf), Dan Sadlier (Lima Central Catholic), Gene Klaus (Delphos St. John’s) and Jim Wannemacher (Ottoville) all played for the University of Dayton in the 1967 NCAA National Championship game against UCLA and its mega-star Lew Alcindor (Kareem Abdul Jabbar). In the spring of 1969, legendary coach Joe B Hall, then an assistant coach of the University of Kentucky, was driving up Interstate-75 to scout a prospective player in Findlay. This was in an era before recruiting became a multimillion-dollar industry. He stopped for gas in Lima and asked the attendant if there were any good basketball players in the area. He was advised there was a 6-foot-10 player going against a 6-foot-9 player just down the road. Hall drove his car to Bath High School where the Wildcats were playing host to Shawnee that evening. His change in plans paid off. Bath’s Jim Andrews and Steve Penhorwood and Shawnee’s Dan Perry all ended up signing scholarships to play for Kentucky, making Lima the smallest community to ever produce three UK Wildcat signees in one year. I have a lot more of these. If you have an interesting piece of sports trivia from west central or northwest Ohio you would like to share, drop me a line. Reach Bob Seggerson at bseggerson@lcchs.edu.